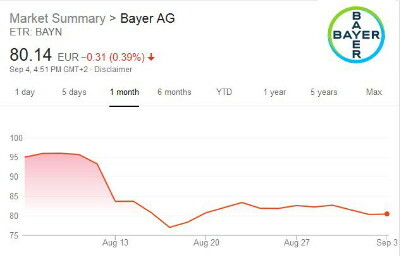 In a special telephone meeting on Thursday, August 23, Bayer AG’s CEO Werner Bauman tried to reassure the German conglomerate’s principal shareholders who were concerned about the recent drop in the company’s stock. Bayer’s stock fell dramatically after an unfavorable verdictagainst Bayer’s St. Louis subsidiary, Monsanto. On news of the verdict, Bayer watched its stock plummet 14 percent and forfeited $16 billion in shareholder value. Strong science suggests glyphosate is the culprit in the exploding epidemics of celiac disease, colitis, gluten sensitivities, diabetes and non-alcoholic liver cancer which, for the first time, is attacking children as young as 10. Glyphosate is in our air, water, plants, animals, grains, vegetables and meats. It’s in beer and wine, children’s breakfast cereal and snack bars and mother’s breast milk. It’s even in our vaccines. Glyphosate now accounts for about 50% of all herbicide use in the U.S. About 75% of glyphosateuse has occurred since 2006, with the global glyphosate market projected to reach $11.74 billion by 2023. In 2015, the World Health Organization’s International Agency for Research on Cancer (IARC) determined that glyphosate, the active ingredient in Roundup, was an animal carcinogen and a probable human carcinogen. In 2017, the California Environmental Protection Agency (EPA) followed suit, listing glyphosate as a carcinogen under Proposition 65. While Judge Bolanos allowed Monsanto’s lawyers to tell the jury that federal EPA and some European health agencies disputed the IARC findings, she blocked us from mentioning California’s decision to list glyphosate as a carcinogen, declaring that it would bias the jury. The surreal incongruity of a California state court silencing California’s own environmental agency while crediting the findings of foreign health agencies and a demonstrably corrupt federal EPA, struck us as strange. Because of the judge’s rulings, Monsanto’s attorneys were able to paint IARC as a lonely (and therefore unreliable) outlier in its conclusions on glyphosate. Judge Bolanos also forbade us from showing the jury evidence of Monsanto’s fraudulent scheme to win regulatory approval for Roundup. In the mid-1970’s when Monsanto first sought to license Roundup, the company hired a corrupt consultant, Industrial Bio-Test Laboratories (IBT), to conduct toxicology studies on the active ingredient, glyphosate. The EPA approved glyphosate for sale in 1974 based on IBT Labs’ jiggered data. IBT Labs made little effort to conceal the fact that its science was fraudulent.One EPA reviewer dryly observed that it was “hard to believe the scientific integrity of the studies when they said they took specimens of the uterus from male rabbits.” A subsequent EPA review found that producing falsified data for Monsanto and other corporations was IBT’s core business model. A federal jury found three IBT officials guilty of attempting to defraud the government by covering up inaccurate research data. Judge Bolanos ruled that Lee Johnson’s jury should hear no mention of the Monsanto/IBT flim-flams. The next chapter of that story was particularly relevant to our case. When the EPA asked Monsanto to retest glyphosate safety in the wake of the IBT scandal, the company’s own 1983 study found a statistically significant number of benign and malignant kidney tumors in male mice exposed to high amounts of glyphosate. This study prompted EPA to classify glyphosate as a possible human carcinogen in 1985. Monsanto protested that its researchers had made errors in performing the mouse study despite anemic evidence that this was indeed the case. Under extreme political pressure from Monsanto’s allies in Ronald Reagan’s cabinet, EPA folded and withdrew the cancer classification on the condition that Monsanto re-perform the mouse test. Monsanto promised to do so, but once the EPA cancelled the cancer classification, the company reneged, refusing to test glyphosate’s carcinogenicity for 40 years. Judge Bolanos ordered that the jury should hear nothing of this important tale and allowed Monsanto to tell the jury that EPA had always believed Roundup to be non-carcinogenic. In one noteworthy email exchange between an academic and Daniel Goldstein, a Monsanto employee, Goldstein joked that the company has been playing “whack-a-mole” to kill or derail carcinogenicity and toxicity studies of Roundup and its associated GMOs for years. At Monsanto’s request, Judge Bolanos deemed any mention of GMOs off-limits in our case. She believed that even a mention of that hot topic would inflame the jury against Monsanto. We therefore could not show the jury Monsanto’s inculpatory “whack a mole” memo. Judge Bolanos’ ban on any reference to GMOs also allowed Monsanto to get away with its unrebutted assertion that “Roundup is great for the soil.” We couldn’t show the abundant evidence of the damage to soils and ecosystems for the Roundup-GMO combination. Most frustrating, Judge Bolanos forbade us from mentioning Monsanto’s “TNO dermal absorption” study, which she inexplicably deemed “irrelevant.” The “TNO Dermal Absorption” study was the company’s own critical research paper documenting how the human body absorbs far higher amounts of formulated Roundup through the skin than previously reported. Monsanto illegally kept the study secret from regulators and acknowledged in its internal communications that public knowledge of this study would “blow up Roundup’s risk evaluations.” Following that study, Monsanto recommended waterproof jackets, pants, faceplate, et cetera for its employees handling Roundup. 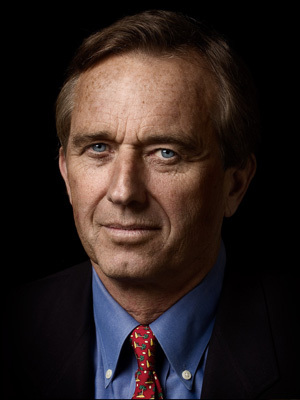 Monsanto included none of those precautions on the warning label of the Roundup used by our client Lee Johnson.Instead of pursuing the TNO safety study to ensure that Roundup was safe, Monsanto executive William Heydens killed the product research “because a further study was not likely to help us meet the project objective.” The “project objective” was maintaining Roundup’s market dominance. Monsanto’s choice to illegally hide the results of the TNO study from the EPA and to abandon the research were directly relevant to punitive damages, but the jury never learned about those events. During the trial, we showed the deposition of Monsanto’s markets supervisor Kirk Azevedo. 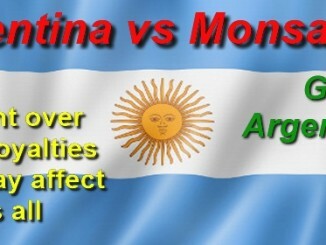 Azevedo was an idealist who joined Monsanto after watching a speech by Monsanto CEO Robert Shapiro promising to make Monsanto a template for green technology and ethical corporate culture. When Azevedo invoked the speech during an office strategy discussion, his direct boss told Azevedo that Shapiro’s speech was PR window dressing, “We are about making money—you need to get that straight.” Strangely, Judge Bolanos decided to order us not to talk about the Azevedo testimony on summation even though she had earlier ruled it admissible. Finally, Judge Bolanos gave a “curative instruction” telling the jury that Monsanto had never manufactured Agent Orange. This statement was simply not true—however, the judge deemed the instruction necessary to neutralize potential bias from statements made by dismissed jurors about Agent Orange in front of their fellow jurymen. Above article reposted with permission from Organic Consumers Association.